Sometime you’re lucky enough to be offer nice jobs. Jobs where you just can’t wait to get started because the idea is so much fun. And when the brief says ‘We need a dodo.’ You can totally count me in. It turns out that the lovely folk at Hodder & Stoughton have exciting, new plans for Hodderscape – their online community for all things SF, fantasy and horror. They’d like a new logo. A dodo. And when their list consists of author such as Stephen King, Benjamin Percy, Laini Taylor, Jasper Fforde and Daniel Polansky? I thinking I had better come up with a good dodo. A pretty damned good dodo. Apparently Jasper Fforde is naming said dodo. Erm… so no pressure there then. Okay. Time to hit the pencils. Well, dodos are fundamentally amusing little guys but drawing one? Right. The whole extinction thing becomes as slight problem. No decent photographs. No video. My first port of call, for any reference, is always the internet. But a terrifying selection of badly stuffed examples of Victorian taxidermy is leaving the whole question a little vague. 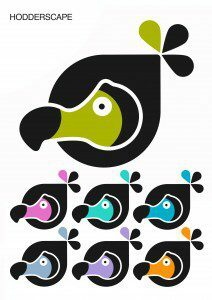 So dodo identification basics… kinda round, fan type tail, staring eye and a big beaky beak, with that distinctive hump. Dodos really don’t look like they were particularly sane creatures. In fact they look like crazy-mad beasties – so I kinda wanted mine to look like a cheeky type of fella. Victorian taxidermists seemed pretty casual about what colour dodos actually were. Having found the big, fat things in red, brown, black, white – and any combination of – I didn’t feel too bad about a extending a little artistic licence. Though, as Hodderscape was originally branded in blue, carrying on that continuity seemed like a good idea. So blue dodo. And, as Hodder & Stoughton have a huge range of genre fiction, Mr Dodo needed to take an interest in all of their work. Meet science fiction, fantasy steampunk, horror and a whole load more dodos! Personally I really liked the idea that the dodo went off and was part of Hodderscape’s fictional worlds. And erm, getting to design a Rocket Dodo was really too much fun. Hodderscape is up ‘n running with their fantastic new website. It offers the opportunity to review, write plus generally get involved in everything SF, fantasy and horror. Go take a look righty here! So, job done. Massively fun to work on and everybody at Hodder & Stoughton – particularly the lovely Anne Perry and Oliver Johnson – gave every dodo encouragement. Me? I’m just pretty damned pleased a fat little dodo I designed was named by Jasper Fforde. The little guy is now officially called Pickwick. Lovely. Sarah is the designer behind our beloved Pickwick Hodderscape mascot. Win a dodotastic selection of goodies! Plock plock! Our favourite science fiction and fantasy book covers of… Judge these books by their covers.